13 Sun/AHAU marks our Ascension to a Higher Consciousness. A Higher Spiritual Identity was born by the Discernment of a Divine Inspiration, and the Will of Human to choose the Sacred Intention. 13 is the number of Divinity. It carries the Power of Correspondence with the Creator. 13 represents an Intention of Collective Consciousness with the One Supreme Creator. 13 symbolizes the Divinity in the Choice to be One. Sun/AHAU is the One Supreme Creator that is Conscious of the Wisdom of the Collective. Through AHAU, we are also connected to the Ascended Ones who rose above their Human Nature to become Identified as Beings of Divinity. 13 Sun/AHAU Completes an Ascension to the Consciousness of our own Divinity, in the Human Choice to seek a Divine Relationship. The Cherokee Day Sign, the Flower, represents the faces of the flowers that follow the path of the Sun. So are we Drawn by the Light. Wherever the Sun resides we find the Brightest Light on what was hidden in shadow, and hidden in plain sight. PORTAL DAY ON TONE 13: Element of Ether – Portal days magnify our Ethereal Experience, thinning the veil to Spiritual Dimensions and elevating the Consciousness of our Spiritual Gifts of Knowing. A Portal magnifies our Connection to the Creator and the Collective Wisdom of the Ascended Masters. We are in the Highest Position to Know the Consciousness of the One Supreme Creator and Human’s Consciousness as the Fruit of the One Divine Spirit. NUMBER 1313: The 13th Tone of the 13th Uinal create the Master Number 1313. Number 1313 is made up of the attributes and vibrations of number 3 and number 1, appearing twice, amplifying their influences. Number 1 relates to our Initiative, and the Power in Believing to Create our own Experiences. Number 3 is the Relationship of the Divine Trinity. Together they symbolize our Oneness in a Divine Connection. 1313 is a Divine Sign that we are surrounded by the Ascended Masters, Angels, and Heavenly Hosts. Number 1313 doubles and amplifies a Revelation of the Divine Power of the Trinity. 13 Sun/AHAU marks our Ascension to a Higher level of Consciousness. The fruit of our own accomplishment is brought to Light. The Sun is the Source of Life, Light, and Happiness for the Whole. We are offered a Revelation that our Greatest Happiness is created from a Dream of Harmony and Equity. 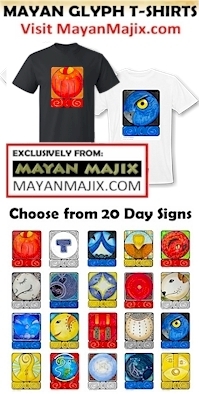 13 Sun/AHAU shines Light on the Truth of our own Accomplishment over the larger cycle of the 260-day Tzolk’in round. The transformations of each trecena helped us to see that every Dream we are inspired to create was Divinely Inspired by the Creator’s Dream for the Whole. PORTAL DAY ON TONE 13: Element of Ether – Portal days thin the veil to Spiritual Dimensions and elevate our Awareness to our own Spiritual Gifts. This thinning of the veil magnifies the realness of our Connection to the Ascended Masters. Their Highest Accomplishment also began from a place of the unknown. Through their willingness and intention to seek a Light that shone in the darkness, their own Light shines to us that the Creator intended us to reach our destination in the Light. We complete the Tzolk’in round on the Ascension of 13 Sun/AHAU. The Vision Quest of this Star/LAMAT trecena has tested our limits as we were opened to the Highest Transformation of Ourselves. Sun/AHAU greets us as our Source of Life and Illumination. Sun/AHAU is the Champion who encourages us to give our every effort. We were asked for one final push as the Sun set on 12 Storm/CAUAC. As someone else was sharing a success story CAUAC sent the thunderbolt reminding me of a major accomplishment. 12 Storm/CAUAC was my final push to finish a long-term work project that seemed bigger than me when I started. I realized how, by making small but consistent effort to be Present in the Moment, all the pieces had come together. It also revealed how significant accomplishments in our lives can be overlooked when we don’t have an Intention to Acknowledge them. GREEN DAY: 13 Sun/AHAU, Kin 260 is a Portal Day that magnifies the Vision of Success we are Worthy to Claim. A thinning of the veil opens our Connection to the Ancestors. The Wisdom they will share will be Multiplied to Abundance by the leader of the trecena, Star/LAMAT. I’ve been anticipating this last day, Kin 260, 13 Ascension, Guided by Sun/AHAU, through a Galactic Activation Portal (Green Day). It’s supposed to complete us and make us brand new. As 12 Storm/CAUAC swept through, I found myself questioning the Truth of my progress, whether the changes were real, or if they would last. It’s our human nature to question. We can let the moments of self-doubt blow on past us as we are just getting to know who we are.